The Royal Tomb (which has the no. 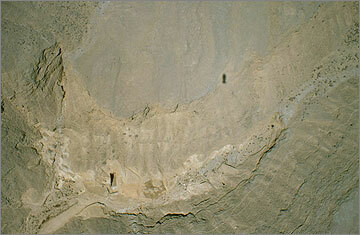 26 in the Amarna rock-tomb sequence) lies in a narrow side valley leading off from the Royal Wadi at a distance of 6 kms. (nearly 4 miles) from its mouth. It was intended for Akhenaten, princess Meketaten, and probably for Queen Tiy also, and (in an unfinished annexe) an additional person (Nefertiti?). 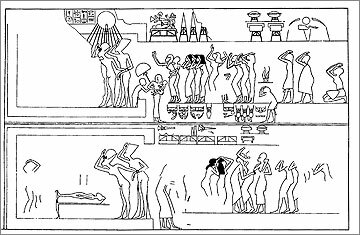 Its basic design and proportions are similar to those of the royal tombs in the Valley of Kings at Thebes, except that since it was intended for several persons, there are additional burial chambers. 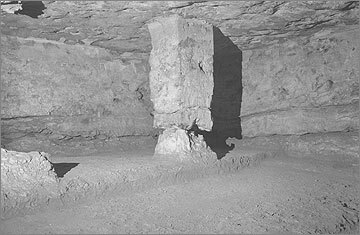 The rock is of poor quality, so that much of the decoration was wholly or partly cut in a thin layer of gypsum plaster spread on the walls. Much of this has been destroyed. Most of the surviving decoration is in the chambers for princess Meketaten. Despite this, the impressive dimensions and dramatic atmosphere of the tomb make it well worth a visit. In 2004/5 the entrance to the tomb was covered by a modern construction intended to prevent the tomb from being flooded by the occasional heavy rains that send water sweeping down the wadi. The main burial chamber in the Royal Tomb. The rough plinth in the foreground was to support the granite sarcophagus of Akhenaten. A detailed description of the Royal Tomb, with plan, is provided in Downloadable Resources/Guidebook. The Royal Tomb was discovered in the 1880s by local people. It had been plundered and damaged in ancient times, and since discovery has been damaged further. Many objects from the tomb are in museums. The most important are: fragments from two granite sarcophagi and their lids belonging to Akhenaten and to Meketaten, the former restored (Egyptian Museum, Cairo); fragments from an alabaster Canopic chest for Akhenaten, also restored (Egyptian Museum, Cairo); over two hundred shabti-figures of Akhenaten. From this material we can be reasonably sure that Akhenaten was buried in the tomb (following his death in his 17th year of reign). The tomb was later so thoroughly desecrated that the fate of the king's body is not known. Early reports of the finding of human remains in the tomb are now impossible to verify. On the south side of the main Royal Wadi are further large unfinished tombs. By their size and location they seem also intended for members of the Royal Family. One (no. 27), in the Royal Wadi itself, has a steep entrance staircase similar to that for the Royal Tomb, leading also to a corridor of impressive dimensions which does not, however, descend very far. 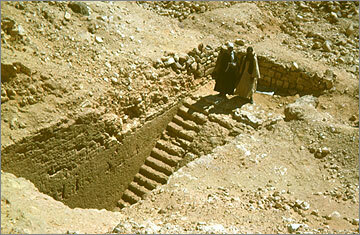 In a side wadi a little to the east are two more unfinished and undecorated tombs (nos. 28 and 29), the latter consisting of a long straight corridor passing down through four doorways. The entrance to tomb no. 29 in the royal valley area. Almost opposite the Royal Tomb itself is a shallow rock-cut chamber (no. 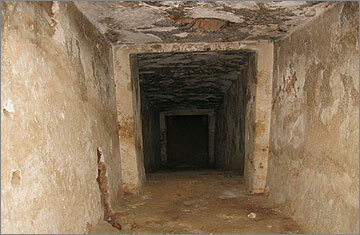 30) which might be a tomb abandoned shortly after it was begun, or a chamber for embalming materials. G.T. 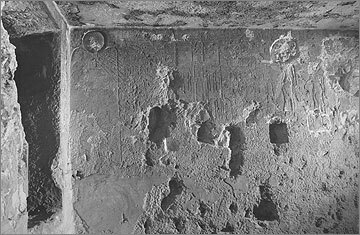 Martin, The Royal Tomb at El-‘Amarna I. The objects (London, Egypt Exploration Society 1974). G.T. Martin, The Royal Tomb at El-‘Amarna II. The reliefs, inscriptions, and architecture (London, Egypt Exploration Society 1989). Aly el-Khouly and G.T. 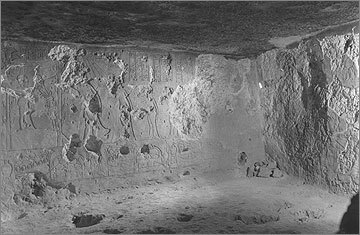 Martin, Excavations in The Royal Necropolis at El-‘Amarna 1984 (Cairo, IFAO 1987). M. Gabolde and A. Dunsmore. The royal necropolis at Tell el-Amarna. Egyptian Archaeology 25 (2004), 30–3.